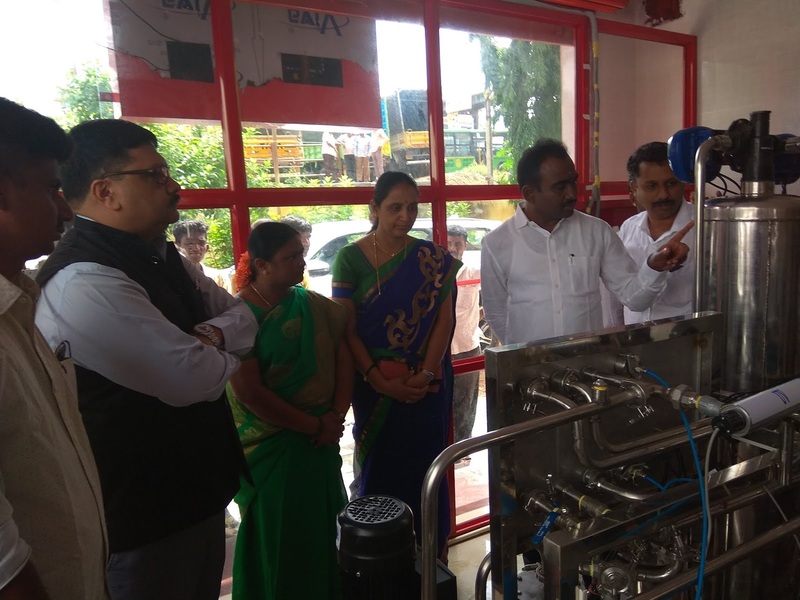 Aligned with its mission to support and provide valuable benefit to the communities, Toyota Kirloskar Motor recently inaugurated its 23rd community based water purification unit at Primary health Centre in Bidadi region [Ramanagara District]. The facility will provide purified water of highest quality for a nominal amount of Rs. 1 per litre to benefit the villagers in the region. With this, Toyota Kirloskar Motor has installed a total of 23 units in Bangalore, Mandya, Ramanagara and 2 units in North India catering to around 7,000 beneficiaries per unit. The newly set up unit has a 1,000 liter per hour capacity accompanied with a minimum 6-stage purification system and dispenses 5,000 to 6,000 litres per day. With a first ever advanced feature - Water Quality Standards & Consumption Data Display, the client can easily access from their location without visiting the site to assess the filtration quality standards of the water [TDS, PH contents] for delivering the high standards of purified water to the community members. Also, the advanced app based filtration system will provided water consumption data on daily basis to ensure the cause reaching the affected. In addition, the installed unit is equipped with solar system, power backup, wastewater management, and 250 ML cup water dispensing with paper cup vending machine among others. The wastewater generated will be discharged into the recharge soak pit after ensuring compliance to waste water quality standards thus ensuring no water waste efficiently contributing to recharging the aquifer. The uniqueness of this initiative has been the assessment & installation of the water purification unit in such identified location which not only caters to the general public for domestic purposes, but also specifically catering to the ailing patients at the Health Care Centre whose water requirements would be more specific to medical needs for healthy recovery & further prevention of possible water borne diseases. Thus, such intervention ensures a larger outreach to beneficiaries of different categories. Commenting on the new unit launch, Naveen Soni, Vice President - Toyota Kirloskar Motor said, “Access to safe drinking water is a serious issue affecting people of all ages, especially for those living in remote communities where the availability of improved water sources is limited. Our aim is to enrich the society with endeavors that are relevant and meaningful with each initiative reflecting uniqueness towards achieving the social cause. In the past, Toyota Kirloskar Motor has installed water purification units at Byramangala, Ramanahalli, Bidadi, Manchanayakana halli, and Harohalli Grama Panchayats and one each in Varanasi and Vaishali to cater to the drinking water requirement of villages in Bidadi. Besides Water Purifying units, Toyota over the years, has undertaken several social projects in the fields of Education, Primary Healthcare, sanitation etc., contributing positively to the society marking a meaningful difference in their lives. The company’s efforts include rebuilding a local residential school, construction of water tanks in rural Bangalore and launch of Mobile medical unit for the sustained intervention in health care system with focus on providing the basic medical equipment to the Primary Health Centers. Besides, the company has undertaken several sustainable flagship programs such as Development of Model School, Lake Rejuvenation, Project ABCD [A Behavioral Change Demonstration] on school sanitation, Toyota Safety Education Programme, Driving Safety Training Programs, etc. Toyota remains committed to bring in more enriching and sustainable CSR projects for the holistic development of the community members, thus effectively contribute to the underlying cause of positive societal growth.